Rebecca Ingram’s new collection for Spring 2019 may be their most exciting yet. 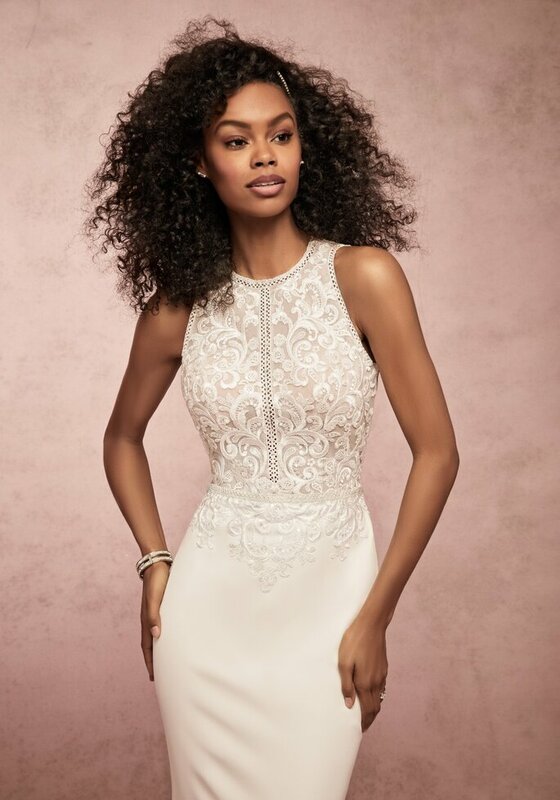 The most affordable of the three Maggie Sottero brands, Rebecca Ingram’s work is highly coveted by a large amount of brides, who know they will be able to find a gorgeous dress at a price that won’t put a serious dent in their budget. And the Seraphina collection definitely does not disappoint! The Seraphina collection was inspired by the classical fairytales – as can be seen in the choice of setting for the range’s photoshoot! – with the intention to create a range of traditional dresses that perfectly complement the 21st century woman. 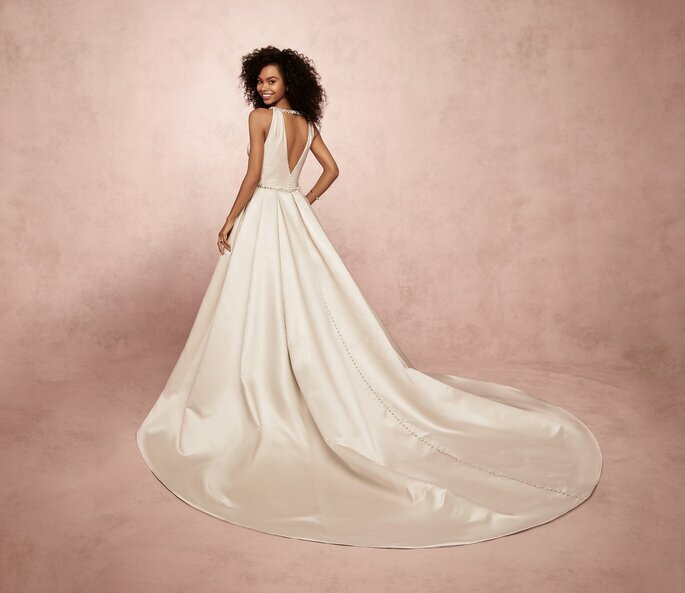 The extensive and masterful use of tulle and lace across this collection are ideal for brides looking for a feminine, princess look – and when matched with dropped backs, low V-necklines and illusion pannelling, they are also thoroughly contemporary too. 3D floral motifs and lace embroidery are also used to great effect in these graceful gowns. The best way to describe the new Seraphina collection from Rebecca Ingram is “timeless”. 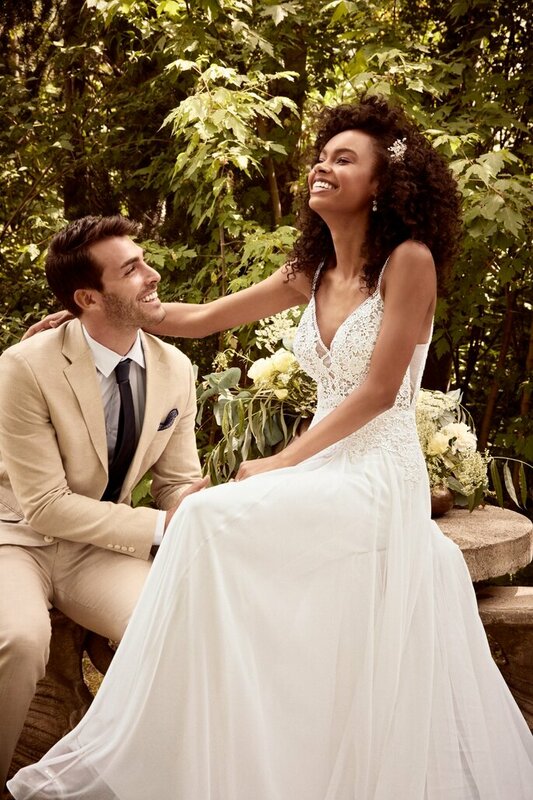 Trends in the bridal fashion industry come and go at an incredible pace – it is sometimes difficult to keep on top on what it is “in” or “trending” for one particular season – but this collection is one that will always be in style. Indeed, these gowns are sophisticated and elegant (and a little bit flirty too! ), and most of all designed to flatter and complement every curve; so not only will you feel beautiful on your wedding day, but comfortable and confident too. The perfect mix, for the perfect wedding! One of the best aspects of the Rebecca Ingram brand is its size inclusivity. 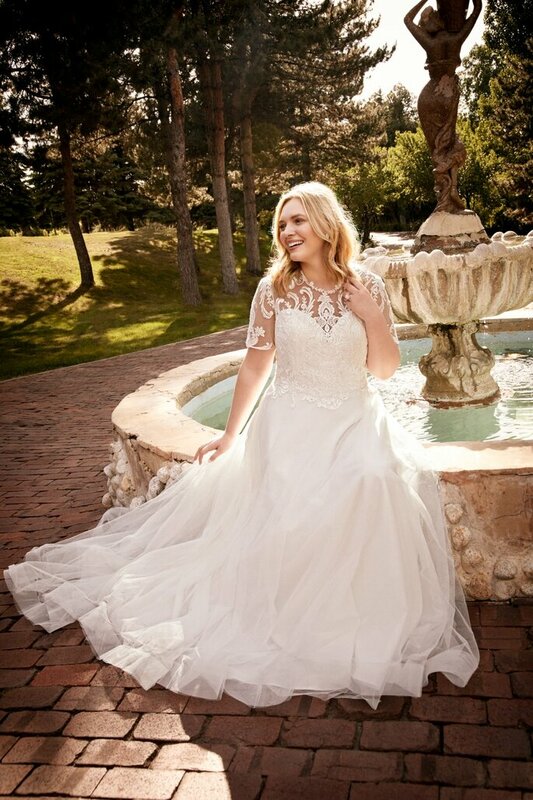 Many plus-size brides struggle to find designers that cater beyond catwalk sizes, and it can make the long process of finding the perfect dress that much more time-consuming. However, Rebecca Ingram is not only available from sizes 0-28, but are specifically designed to complement different body shapes. 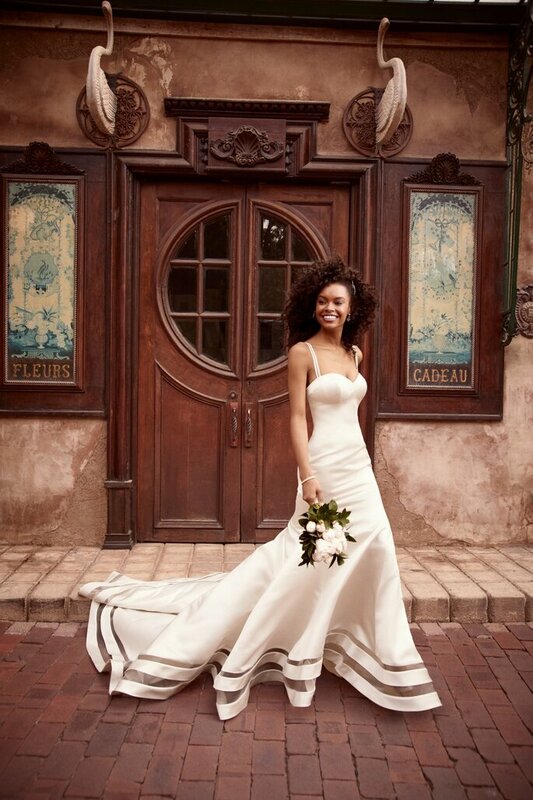 Few other bridal brands provide across such as spectrum of sizes, and Rebecca Ingram tailors its work so that ALL brides can feel fabulous on their wedding day! 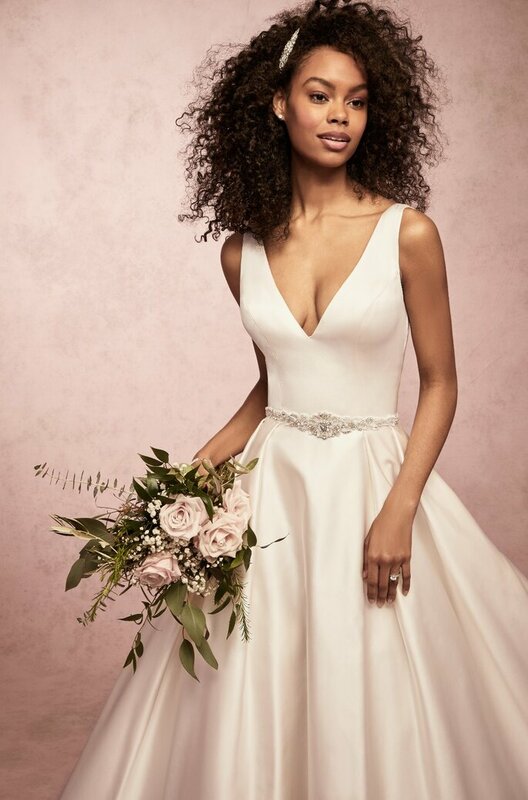 Although traditional bridalwear is back for 2019, the new Seraphina collection is so versatile that women of all styles are sure to find the perfect look. 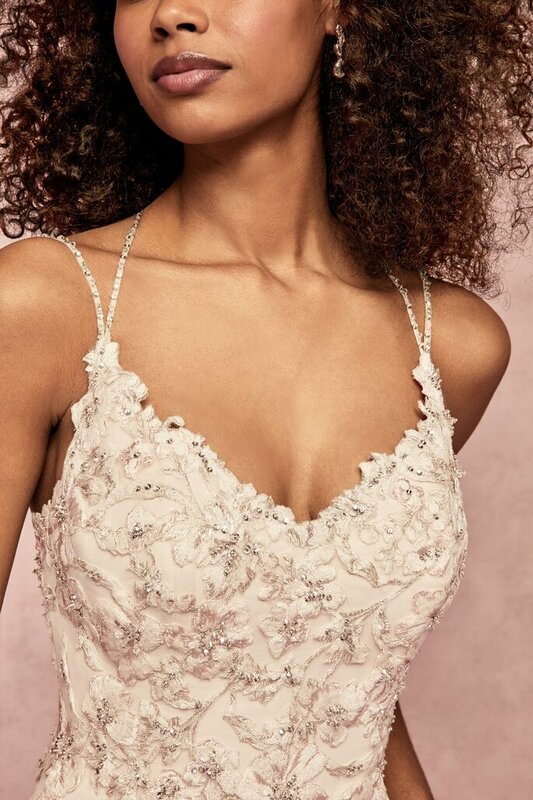 Bohemian brides will love the use of allover lace and long sleeved-options throughout the range, while “alternative” brides will take one look at the illusion cutout hemline on the Jamilia dress above and fall in love! Meanwhile, the silhouettes of these dresses mean that shorter women have many options, especially with the amount of A-line gowns on offer. 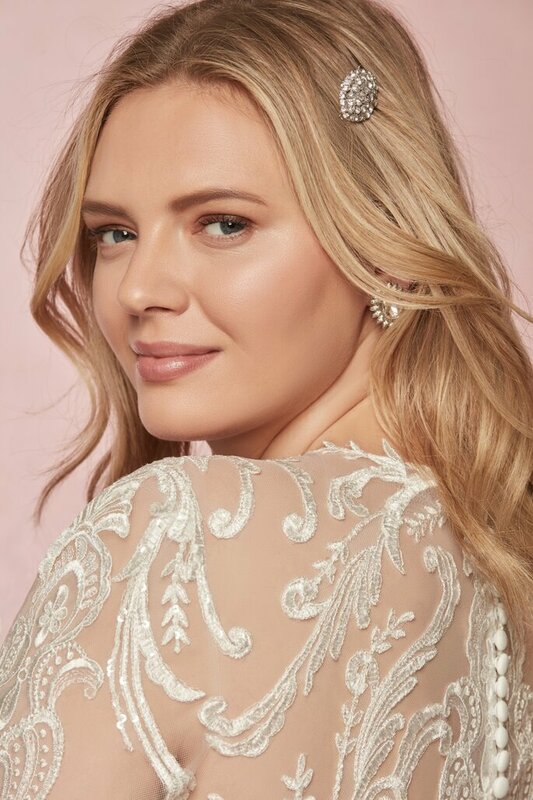 And although Rebecca Ingram has always preached the message that “simplicity equals elegance“, the Seraphina collection does feature some incredible intricate embroidery, and dazzling beading techniques. These embellishments are very feminine, and create an air of luxury – something that every bride is looking for on her big day! And it is the mark of a truly talented designer that these embellishments do not overpower the dresses – instead, they complement them, and create bridalwear that will make the women who wear it shine! Rebecca Ingram delights us with every new collection, and the latest Seraphina range is no exception to this rule! Full of glamour, style and total sophistication, this inclusive brand proves once and for all that brides do not have to break the bank to look incredible on their big day. 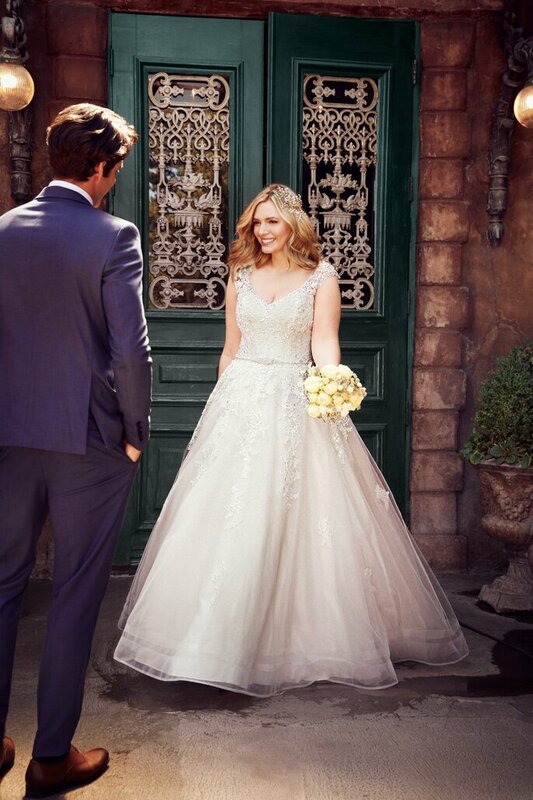 So if you’re on a bit of a budget, but don’t want to compromise on finding the dress you’ve spent decades dreaming about, then there’s no one we could more highly recommend than Rebecca Ingram – there’s something for everyone!